It was one of exciting news that new iPhone 3G is officially launching here in Canada on July 11th. Yes, Friday , July 11, is the day the iPhone will be officially available to Canadian customers with Rogers Wireless. The iPhone we’ve been Waiting For!!! Are there going be a long lineup outside Rogers wireless shop or Apple store waiting to buy new iPhone 3G? NO way, NO lineup, No iPhone, and No Rogers. Canadian customers are so upset with Rogers pricing structure with iPhone that Voice and data plans will start at $60 per month for 400Mb Data, 150 Min. call, with 75 text. With all extra fees (911, call display, call waiting, system access fee…etc) the price will easily reach $100/month. So with simple math caluculation on 3-year contract to get a iPhone at $199. The cost of carrying a iPhone will nearly $3,000 ~ $4,000 or even more. 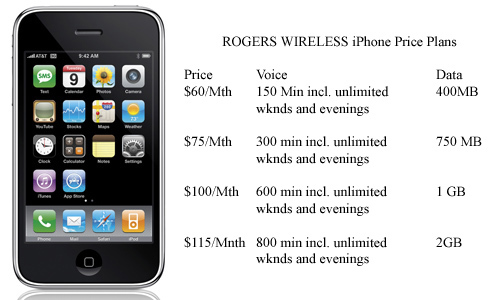 “We’ve designed a pricing structure that offers affordable, flexible voice and data packages so Canadians can truly unleash their iPhone 3G experience on Canada’s fastest wireless network,” Rogers chief marketing officer John Boynton said in a statement. Whoever approved this marketing or pricing strategy at Rogers Wireless, he or she was skip the chapter one of Marketing 101. You do everything for successful new product launching through Effective Price point & Marketing processes , it’s not a stage to make money from it! Even Apple disgusted with Rogers Wireless dumping Apple’s state of art must have piece. As a result, Canadian Apple Retail stores won’t be selling the new 3G! And Customers are reacting by signing petitions and boycotting Rogers Wireless. People are gathering RuinediPhone.com for petition demanding a change in Rogers’s pricing structure. It’s just ridiculous!! I just signed petition demanding UNLIMITED data data plan for iPhone like everyone else! The Canadian dollar retreated back below $1.02 US on Thursday as investors continued to bail out of the Loonie. That’s its lowest close since Oct. 4, according to Bank of Canada data. The Loonie has now given up almost nine cents US since it peaked at a modern-day high of $1.1030 US on Nov. 7. Yet, Loonie still hits 30-year high. With a strong Loonie in my pocket, I could possibly get 10 to 30% cheaper goods across the border. It is also obvious that Canadian importers enjoy the strong Canadian dollars. But in the other side of strong Loonie, it also harms on the Canadian economy. Suddenly, it’s far more expensive to buy Canadian goods or sightseeing around Vancouver for our American friends. Who else got hit by strong loonie? According to this article via Foreign policy, it’s B.C’s marijuana growers. With weak USD or strong loonie, it’s far more expensive to buy “the world’s best pot” and smuggling profits disappear. This means that the backpacks of cash that regularly cross the Canadian border to buy pot have declined in purchasing power and it’s no longer worth the risks and costs for many smugglers. This is bad news for Canadian growers, who ship about 90 percent of their crop to the United States, as well as for their customers in the United States, who now have to pay a lot more or buy elsewhere. “It’s very simple,” said Stephen Easton, professor of economics at Simon Fraser University in Vancouver, B.C. …“The upshot is that the Canadian marijuana is now less competitive against marijuana grown elsewhere,” Easton said. FP concludes that the big winners from all this are Mexican marijuana growers, who will likely step in to fill the gap (the peso is struggling as well), and Econ 101 professors at U.S. liberal arts colleges, whose students will soon be clamoring for answers. Anyhow, The financial tables have turned, and global economics have done what U.S. law enforcement could not: Seems like Capitalism has stopped the smugglers in their tracks. This line reminded me an interesting article from local Korean newspaper in recycled box. A week old article wrote, original articles copied from overseas Korean newspaper(The Dongpo News,재외동포신문), about the interesting results from the price of a Kimchi Jjigae in different parts of the world. Not the Big Mac Index but the Kimchi Jjigae Index(김치찌개지수). The Dongpo News started its research on the price of Kimchi Jjigae around the world back in 2004. This year’s result, the Kimchi Jjigae Index, concluded from the pricing comparison in 62 cities around the world. The standard price of Kimchi Jjigae was set at 5000 won (approx. $5.50) as indexed as 100. So, You need to pay as high as $32 in Zurich, Switzerland or you could enjoy Kimchi Jjigae as low as $2 US in Kunming (昆明), China. Zurich got 620 index points and Kunming got 40 points. If you go to Berlin, it costs 12 Euro ($17) and 15Euro ($22) in Paris or in Amsterdam. KJI, of course the Kimchi Jjigae Index not the dear Leader KJI, ranged from 350 to 620 in Europe. You could enjoy Kimchi Jjigae less than $4 in anywhere China where Miyazaki (宮崎市), Japan scored parity with Seoul. In Moscow, you need to pay $12 (220 KJI) and it cost $3.50 in Bangkok with 64 KJI. In this part of the world, Kimchi Jjigae priced at $13 in Washington DC, $10 in New York, $9 in Miami, $6.99 in L.A., and $7~$8 here in Vancouver. North American KJI ranges from 150 to 220. Kimchi Jjigae priced less than $11 in 45 cities out of 64 cities. It priced at $7.50 ~ $8.50 in average in the globe. The article points that the price dropped by 30% in Japan and North American cities caused by growing Korean population and the Korean wave (한류). It also claims that the Kimchi Jjigae Index, KJI, shows similar pattern as the Big Mac Index. The Article also briefly states about the Soju index, indeed. SOJU! You need to save some bucks in Frankfurt to drink a bottle of Soju; it’s a shocking $27. It’s $3.47 in Kunming. I’m Kunming!!!. Soju costs $11 in global average. So, you could drink a bottle of Soju with Kimchi Jjigae around $20. Of course taste will vary in different cities. For your tip, here is one of the best Kimchi Jjigae restaurants in Seoul that I recommend to anyone who ask for the best Kimchi Jjigae. It is located near by Sejong Center, GwangHwaMoon. In fact, it’s called, GwangHwaMoon House (광화문집). The restaurant serves the finest taste of Kimchi Jjigae if you don’t mind pieces of chunky pork belly. A plate of rolled egg fries (Gaeran Mari(계란말이)makes good combination of menu. But a bowl of rice does not come with Kimchi Jjigae. That’s right, you need to pay extra for it! Oh! This week’s TGIF song, I picked Koong Pak Life(쿵팍 Life) By JK Kim Dong Uk ft Leo Kekoa – TGIF!! According to news, Telus Corp. and Bell Canada Inc., the target of several privatization bids in the past few months, said they have been discussing a merger that has the potential of creating a combined market capitalization of more than $50 billion. Vancouver-based Telus plans to make a cash-and-stock bid for its Eastern Canadian counterpart. Bell Canada has a market cap of about $29.45 billion, while Telus, of Vancouver, British Columbia, has a market cap of about $20.31 billion. Is this move really going to create “an all-Canadian solution” in a benefit to customer? or it would create a super jumbo giant that monopolizing industry with sky-high wireless phone bill? While professional Investors have their say on ‘Belus’. I hope there’s wider open door policy for privatization not only to Canadian players but also to others so I, as a customer, could enjoy record low cell phone bill under fierce marketing war between service providers like in the US. AND more important news for me is that it’s the first day of Summer and it began officially with the solstice at 11:13 A.M. And this summer is going to be cooler than normal while the rest of Canada should experience hotter summer. Still, I will try my best to enjoy the 100 days of b.e.a.u.t.i.f.u.l Summer. Oh! It’s 1st Anniversary day of my blogging journey with “Hojupjimong: I dream therefore I am“, can’t believe I still filing up my konglish posts, wow! What do Canada and Texas have in common? Lone Star replaced with Maple Leaf while Korea still located in peninsular. Very interesting. The creator of map also provided a run-down of the 51 states, plus DC as following. California, it is often said, would be the world’s sixth- or seventh-largest economy if it was a separate country. Actually, that would be the eighth, according to this map, as France (with a GDP of $2,15 trillion) is #8 on the aforementioned list. Texas’ economy is significantly smaller, exactly half of California’s, as its GDP compares to that of Canada (#10, $1,08 trillion). Florida also does well, with its GDP comparable to Asian tiger South Korea’s (#13 at $786 billion). For a more accurate data, invest your time in the U.S. Bureau of Economic Analysis. Of course, I was also wondering where would the big players like China, Japan or EU be renamed? Don’t need to worry, another blogger kindly created this map where China took most of west coast while Japan relabeled the entire mid-states, indeed. So is Minnesota can be named as Minnekaido (or Hokkaisota) after Hokkaido?